In our last Honey blog post we discussed caring for your body as a creative, today we will talk about keeping the mind healthy as well. I have lists everywhere, for everything and sometimes the same list in a hand-written and digital version. Goodness, life is busy isn't it? As a freelancer I find that I am brainstorming for new projects, in the middle of a few projects and wrapping up others, all at the same time. My mind is all over the place. I am also an A-type personality so chaos puts me over the edge. As Hart & Honey approaches it's first birthday we have really exciting projects in the works and can't afford to drop the ball. We've come up with a few tips and tricks to help keep ourselves from panic attacks! A challenge I faced when going freelance full time was reinventing structure. I love structure, I need structure but with no one above me organizing my priorities I had to figure it out for myself. I started keeping a list in the front of my sketchbook of all current clients and the deadlines I had for all of them, that way I could prioritize better. Having time assigned to projects helps to stay focused and make sure nothing falls through the cracks. Good communication is important in any relationship, without it the relationship will likely fail. Hart & Honey also has a standing Thursday meeting that we protect, we keep a list of everything we need to talk about throughout the week knowing that Thursday we will have time to discuss. We also keep all of our meeting notes, timelines and even bills in one place online, that way we can access it from anywhere and we both can see the changes immediately. There are many "cloud" systems out there but we love iCloud, our email, checklists and word documents are all easily accessible and we can work on them at the same time. In order for us to focus and be productive is allowing ourselves to enjoy life throughout the week. We make time for friends, family, exercise and even just relaxing because we see the value in mental health. 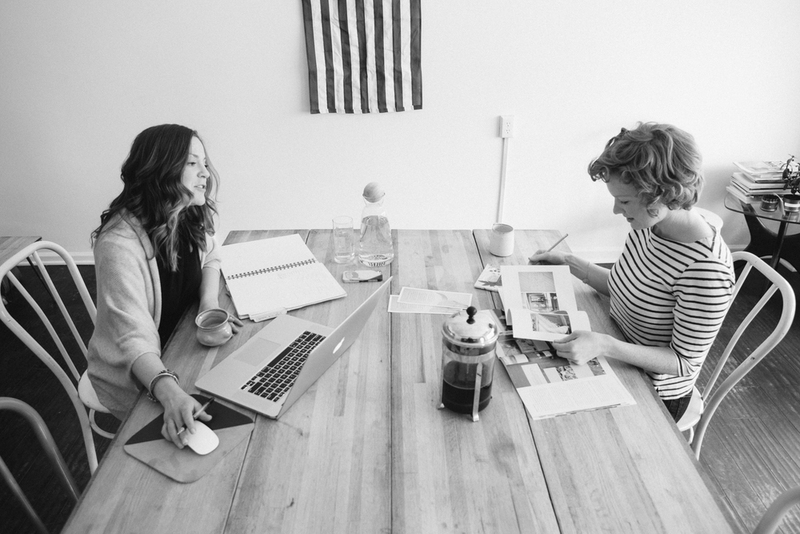 When Hart & Honey moved into our studio space is was so easy to talk about work all the time, but we both started to feel unsettled and realized that we needed friend time as well. Give yourself grace, life is too short for it to be full of only work. We both really are inspired by the Design Sponge podcast, specifically there were a couple that were so helpful: Work Life Balance as well as 10 Tips for Business Owners. As artists we will always find something we can finesse in our work. Knowing when to call it quits for the night is important for your mind and body. Sometimes the best thing I can do is walk away from a project, have a dance party, take a walk, go the gym, eat dinner with my family or just get a good nights rest. I come back with a fresh perspective because I've engaged in activities that realign mind, my stress level is down and my home life is in a good place. Sometimes getting a pile of laundry done is all I need to do to clear my mind and get over a creative slump. TIP: keep a notebook by your bed, instead of laying awake thinking about your list, jot it down so you can relax and take care of your ideas and dreams after a good night sleep.